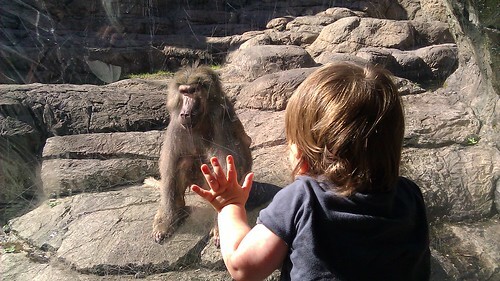 boy vs baboon, originally uploaded by Venus In Furs. It's been a busy couple of weeks. Gibson has made it through an earthquake and a hurricane unharmed and oblivious to it all. We've been apartment hunting and since we found a place out in Bay Ridge we've been packing. We're aiming to do the big move at the end of the month. It's a lot to do, the packing and moving with a small child. But we're making progress and Gibson seems to enjoy the large boxes, so there's that. We spent my birthday on Friday at the Prospect Park Zoo and wandering the park. After a week of rain it was a gorgeous and mild day and Gibson signed kittycat whenever he saw an animal. Also he's been saying "ah wa wah wah" when he wants water to drink. It's super cute. he is amazing! what a big guy!